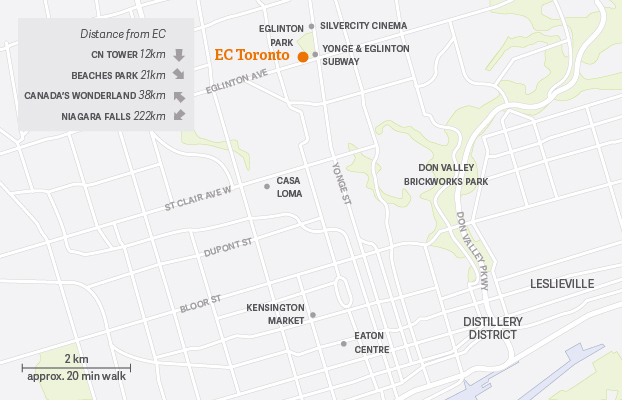 Friendly, spacious and newly refurbished, EC Toronto is located in Canada’s largest city and financial capital. This multicultural destination is formed of unique neighbourhoods and has everything to offer: arts, music, sports, museums and more. I recommend EC Toronto because it's a place where you can learn a lot and make many friends from around the world. Come join us! You'll love it! After graduating from university, I had a strong desire to travel and learn about other cultures. Teaching English gave me that opportunity and I spent two life-changing years in Korea. Moving to Toronto was, initially, a temporary situation – finish CELTA and head back abroad. I quickly realized it would not be so easy to leave this beautiful city. During the last year, many students have expressed similar sentiments. Toronto is one of the most multi-cultural cities in the world; riding the subway in the morning is a testament to that, and provides a small glimpse beyond the borders and colours of a world map. There is always something to stimulate the eyes or provoke thought: the view from the CN Tower gives one a unique view of urban sprawl, while the graffiti scattered throughout downtown highlights the importance of art in the city. EC Toronto is unique in that strong relationships form among teachers and students, and the student-centered approach makes lessons interactive and enjoyable. The friends, laughs, and experiences are bound to leave indelible marks. Learn how Canada's Premium Pilsner by visiting the brewery for a tour and taste. You'll learn why Steam Whistle was designated one of Toronto's "green buildings" and about our railway history.